1. Brush the courgette slices with a little oil and griddle for 4-5 minutes turning once until softened. Meanwhile, cook the kale in boiling water for 5 minutes and drain well. 2. Poach the eggs in a saucepan of boiling water to your liking. 3. 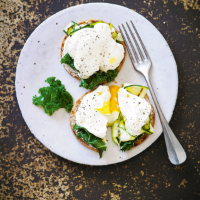 Spread the muffin with the soft cheese, top with the kale and courgettes then the eggs. Spoon over the mayo, season and serve.